Give your landscape beds a clean, easy to maintain edge, with these products. Concrete edging provides a durable, maintenance friendly solution. Natural edging gives a look as if it’s always been there. Both are available in many different colors, stamps, and shapes. Water Features - Water Gardens, Pondless Waterfalls, Streams, and Fountains. Many customers love the options that come along with creating their own water garden. We can install a pond perfect for goldfish or koi, water plants, and your personal lawn ornaments. Underwater lighting lets you enjoy your water garden at night as well. Do you really enjoy working in the garden, but just don’t know where to start? Save yourself some time and money, by letting us help you. 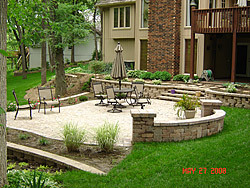 For a fee, we can design your landscape and give you instructions on how to install it. We can also deliver topsoil, rock, mulch, and even pick out your plants and deliver them to you. Keep your lawn green, healthy, and weed free with our application programs. Also, give your lawn a professional look with our straight, wide, and diagonal cuts. Grub Control - Don’t let those nasty grubs destroy the lawn you’ve worked so hard for! Prevent them with Merit, the best grub control chemical on the market.